Will Your Insurance Company Cover Holiday Damages? The holiday season is known as the most wonderful time of the year. But they aren’t so wonderful when your home has suffered fire damage, water damage and theft. The holidays bring increased risks for homeowners. Christmas lights and decorations are responsible for countless house fires throughout Miami. It only takes one fire to destroy your biggest investment. Although South Florida does not face any risks of water damage from frozen pipes, Miami homeowners are still vulnerable to water damage caused by floods and pipe leaks. While the holidays are a time of giving. It is also the busiest time of the year for burglaries and theft. The good news homeowner’s insurance should be able to cover most of these damages and losses. The bad news is your insurance company may not provide a suitable settlement to cover repairs and losses. Some damages are not covered at all. It is important for every Miami homeowner to be insured. However, not every homeowner takes the time to properly review their insurance policy. What you do not know about your coverage can come back to haunt you later. Here are some of the most common damages not covered by some insurance companies. Floods: Due to Miami’s tropical climate, floods are a constant threat. Unfortunately, floods are not covered by most homeowner’s insurance policies. Some insurance companies will cover pipe leaks or sewage overflow. Miami homeowners will have to purchase separate flood insurance. Mold: Mold is one of the most common forms of water damage. Miami buildings are highly vulnerable to mold due to South Florida’s humid and wet climate. Many cases of mold damage are the result of water leaks and poor home maintenance. While most insurance companies will cover mold damage caused by sudden plumbing leaks, many do not cover new construction to remove mold from the building. Wear and Tear: Homeowners are responsible for properly maintaining their home. Any damage caused by negligent maintenance will not be covered. The purpose of insurance is to assist property owners that have suffered damage or losses beyond their control, such as fire, storms and theft. Insect & Rodent Infestation: Most insurance companies will not cover damage caused by termites, rats or carpenter ants. Insurers believes infestations are the responsibility of the homeowner to properly maintain their property. Windstorms: Due to its location, Miami is extremely vulnerable to hurricanes, tropical storms and tornadoes. However, some insurance companies do not cover damages from windstorms. Even those that cover windstorms often charge a special wind deductible. Depending on your insurance company, some homeowners may need to purchase separate windstorm insurance. When an insurance claim has been underpaid or denied, it can leave homeowners in a very difficult financial position. Many make the mistake of simply accepting a less than adequate settlement. Fortunately, there is a solution. It starts with seeking representation from an experienced Miami insurance claims lawyer that can properly assess the worth of damages and losses from their own adjuster. They can also protect your rights as a homeowner and help them recover the settlement they deserve. 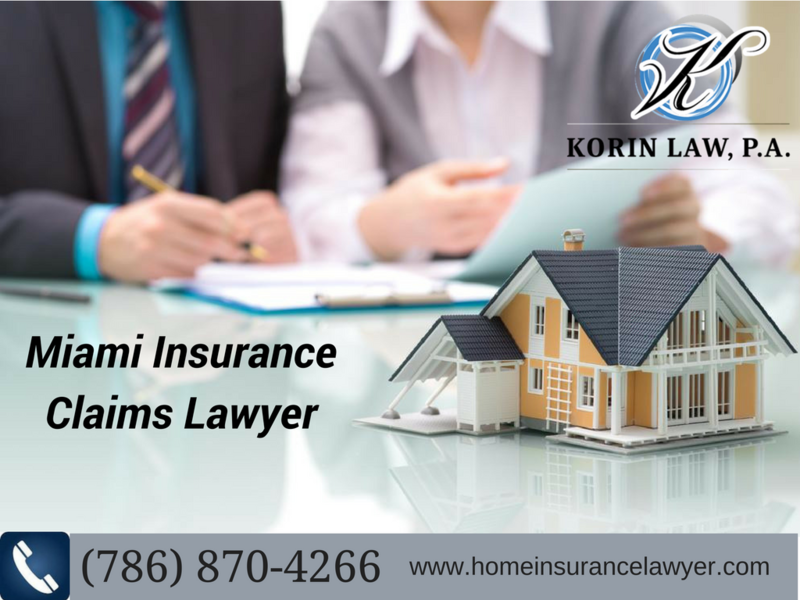 To learn more on how a Miami insurance claims lawyer can help, contact Jonathan Korin at Korin Law, P.A. and schedule a consultation to discuss your case.